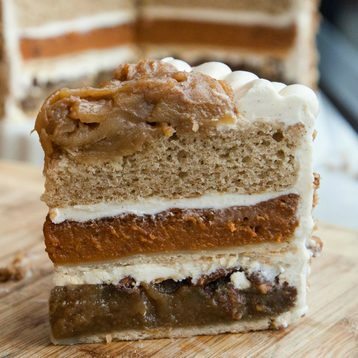 The PieCaken is the same idea, only with dessert foods instead of meats. First, there’s a layer of pecan pie. The next layer is pumpkin pie , and last, but certainly not least, is a layer of apple upside-down cake. This delectable dessert is made complete with cinnamon buttercream frosting, glazed apples and a crunchy oat topping. Not only does the PieCaken exist, but you can also order it online. It retails for $75 , but we think it’s totally worth it for a Thanksgiving dinner split among many people.